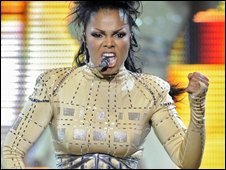 Singer Janet Jackson was taken to hospital after falling ill shortly before a concert in Canada on Monday. The 42-year-old had to cancel her Montreal show after she "got suddenly ill" during her sound check, her publicists said. Jackson was being monitored at an unnamed hospital but no further details of her condition have been released. The singer hopes to reschedule the concert, which was part of her North American tour. Last Friday, Jackson cancelled the weekend Detroit stop of her Rock Witchu tour due to "production constraints". She recently also announced she is to leave record label Island Def Jam after just 14 months. Her first album with the label, Discipline, was released in February.